The comedian Kevin Hart’s new signature Nike shoes represent a complicated mixture of pride and injury. My parents taught my siblings and I the value of work at an early age. We wrote out contracts to earn money for housework that went beyond our basic chores. We would agree on a salary, a date of completion, and sign at the bottom. In 1999, after saving up money from housework and allowance, I had enough money to buy a pair of sneakers with my own money for the first time. The pair itself was insignificant: black-and-red Jordan 14s that I would not entirely find appealing today. But the act of the purchase was liberating. To have earned the right to dictate what I wore on my feet, on my own terms, those Jordans became a window, open wide enough for me to crawl through and enter a world where I was celebrated, tall, fearless, gifted, and still black. Being black and coming of age in the ’90s meant that you likely were also sold this dream, or one similar to it: Put on a pair of shoes that you saw on television, gracing the feet of an idol, and for a moment, your world seems not as distant from theirs. From the rap stars with unlaced low-top Adidas to the high-top Nikes I saw on the basketball court, I believed at an early age that being able to pull on a coveted pair of sneakers meant something. It was another form of black escape. A way to feel even, eye-to-eye with a world that did not want you. 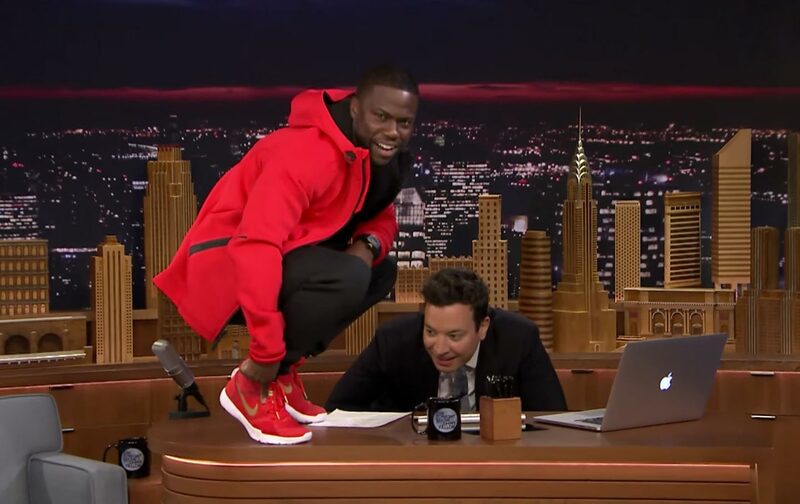 A little over a week ago, Kevin Hart debuted his new signature Nike shoes on The Tonight Show Starring Jimmy Fallon: a pair of red-and-gold high-top cross trainers, covered in Hart’s inspiring quotes. (The shoes will also be available in blue and gold.) If the sneaker is truly a window, I found it most open and accessible to me while watching Kevin Hart excitedly debut his sneaker on national television. With a handful of recent exceptions, the sneaker-endorsement market remains dominated by athletes. Often world-class athletes, existing in a space that most of us feel separated from by a vast number of degrees. I will likely not purchase Kevin Hart’s sneaker, but I enjoyed knowing that he has one. To have grown up in an era consumed by only the most elite black athletes gaining sneaker deals, I found myself warmed by considering this era of young black kids watching entertainers like Kevin Hart, Kanye West, and Drake attain sneakers of their own. The kids who cannot throw a football, or are too short to make it on the basketball court, but who can make a class laugh, or sing, or rap. The window becomes more open to these youth than it ever was before. This possibility that says there is more than one way to gain the type of black success that will reward you with your name on something you love. The truth is, there are so few ways to engage in capitalism and walk away with an unscathed conscience. Even with my excitement about the idea of Kevin Hart’s sneaker, I’m a different type of sneaker owner now. While I still purchase more than my fair share of sneakers, especially according to my wife, I have to think of more than just what goes on my feet. The days of my waiting in any line for shoes are long gone. But the biggest change is that I stray further away from buying sneakers to keep up with trends as I get older, and consider most of my purchases largely historical and sentimental. I search for, and buy, the sneakers that I could never have the heart to ask my parents to buy when I was a teenager. This, for me, is a part of reclaiming a history that I couldn’t afford, something else that I think is essential to the black experience in America: using the present to revel in what the past could not give you. I’ve stopped viewing the sneaker as a window, and have begun to imagine it as a mirror. A thing firmly planted in the ground that I can look down at, see my living reflection in, and remember what carried me to where I am. There is, however, another side of sneaker ownership and pursuit. I have never seen, firsthand, the violence that rests on the other side of sneaker production and ownership. But I know it exists. The same way I learned to eat a steak without thinking of the slaughter, I learned to own and purchase sneakers without thinking of what attaches itself to that ownership. It’s not just the violence that too often affects people who own sneakers, or wait in line to purchase them: The violence ingrained in the oppressive structures that lead to the manufacturing of many sneakers is also present, if less visible. It was exciting to watch Kevin Hart climb onto Fallon’s desk, shouting like a child; and I also have to consider how he figures into these larger, more powerful systems in the same way that I considered (and still have to) how Michael Jordan plays into it. The corporations who use talented people of color to open these windows (to identity, to belonging, to pride) are rarely held as accountable as the people of color themselves, be they athletes or entertainers. The truth is, there are so few ways to engage in capitalism and walk away with an unscathed conscience. By way of our own need for survival and/or entertainment, most of us take part in, or are complicit in cycles of harm and oppression. This is the current standard of life in America, and sneakers are no different. For sneakers, the marketing hasn’t changed in who it targets, or how it targets them. The idea of the sneaker as something that allows you to become a better, more confident you is still firmly in place, and the you is often black, young, sometimes poor. The grand weight of sneaker ownership, for me, lies in the fact that I have no answers for how to stop any of the multiple acts of violence associated with the culture, but I still view sneakers as a pane of glass, something that shows a reflection of the person wearing them. I believe in the dream, and not always what the dream drives people to. As the dream expands to rappers and comedians, I imagine that there could one day be a writer who has her own Nike shoe, or a dancer, or a senator. I hope to see the dream stretch itself to every corner of the imagination, a window open wide enough for all of us to fit through. Hanif Willis-AbdurraqibHanif Willis-Abdurraqib is a poet and essayist from Columbus, Ohio.